Why, Hours after the Election, did SEVEN People Travel to an Undisclosed Location to Hold a Very Private and Highly Secured/Guarded Meeting? Their Plan. I find this so interesting. This is basically DJT was elected and should not have been. The HRC team worked to kill him before he took office, then destroy him after which was all sussed out here and elsewhere. Qmap.pub 'online' counter now shows only 18,000. Has header message: "Maintenance: updating online user counter (ignore for now)." Is Sb2 on Twitter? I heard they did a decode on the Fed but I can't find it, have you seen it? Kinda perplexed at the moment on who this company or country might be. “I think, prior to this opinion, many lawyers probably assumed that the evidence held outside the U.S. by the [state-owned] entity would be largely—not entirely, but largely—immune from the reach of a U.S. grand jury. The D.C. Circuit took remarkable measures to conceal the identity of the lawyers in the case and the identity of the state-owned company, closing an entire court- house floor in downtown Washington for oral arguments in December. For more than an hour, a U.S. marshal declined to let reporters pass through the hall. There are regions in the world with many partially or fully state-owned companies engaged in commercial business,” Kim said. “To the extent these state- owned enterprises in these countries thought there was a question or uncertainty about whether or not they could be subject to the criminal process in the U.S., this decision, at least, says they are.” Kim said prosecutors in the past might not have been inclined to litigate a foreign, state-owned com- pany’s claims to immunity to a grand jury subpoena. “Now, prosecutors would be more likely to press, since they have a circuit court decision that they can point at to compel compliance or use in any litigation over the is- sue,” he said. I’m pretty interested to see what the SC does regarding this secret company’s petition. CT, SB2 still primarily uses reddit. 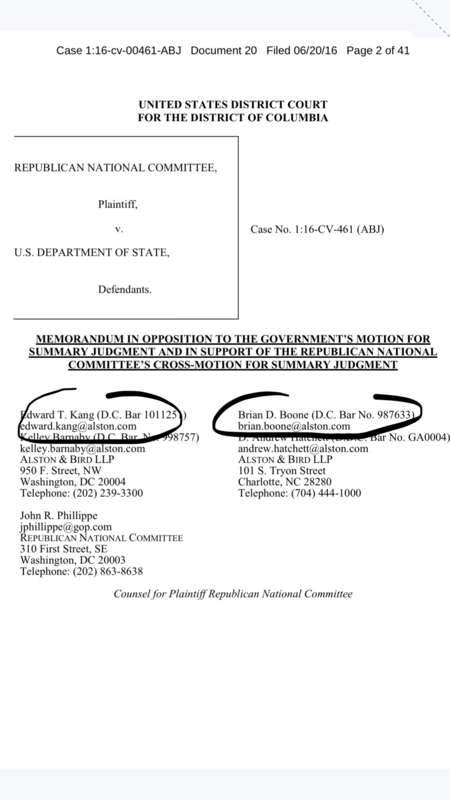 The same lawyers representing the “secret company” involved in the SC discussion today are in this court case documents regarding RNC vs. State Dept. So the same two lawyers.... v. interesting. I have no proof to back this up but my gut tells me they are saving the big denuke/peace announcement with NK for fuel at a good time. I feel like all of the back and forth is just theatre. Can they draw it out until 2020? I just don't believe there is any danger of it not happening.